Did you know there is a substance called Vitamin Q? We are all familiar with Vitamins A, C, D, E and the range of B vitamins. But very few of us know about Vitamin Q – also called Coenzyme Q10 (CoQ10) – which is synthesized by the body. What is so special about CoQ10? Coenzyme Q 10 plays a vital role in the delivery of cellular energy. It also has potent antioxidant effects. Unfortunately, as we age the production of CoQ10 tapers off. This means as you grow older, the amount of CoQ10 in your cells become less and less as you age. As a result, cells lose their efficiency (energy production) and protecting capacity (antioxidant power) which are important requirements for healthy young skin. So what can you do about the declining CoQ10 in your body? You can use supplements – both internally as capsules and also on the skin in the form of serums. CoQ10 is used in premium anti-ageing skin care products to boost skin repair and regeneration. It rejuvenates the skin by enhancing the cell’s efficiency. It’s really important that it is used in high enough quantities to do a decent job. Experts recommend a minimum of 0.5% in skin care products. There are 5 ways in which CoQ10 benefits your skin. 1. It energizes your skin. Young skin has ample amounts of CoQ10 and so has lots of energy – energy needed to repair damage and make sure the skin cells are healthy. 2. It protects against photo-aging – that means premature aging due to over exposing the skin to the sun. The sun is the fastest skin ager. If you don’t believe me, just compare the skin on your behind (that is hardly ever exposed to the sun) to the skin on your face. Enough said! 3. It rejuvenates skin by stimulating skin cell activity. Active skin cells get rid of toxins easily and can make better use of nutrients. When your skin ages, all these processes slow down, causing dull and sallow, wrinkled skin. Boost your skin cell activity for younger looking skin with CoQ10. 4. It stimulates collagen production. Collagen is the protein that decreases as we age, leading to wrinkles and leathery skin. Helping you make more collagen, CoQ10 is a skin saving essential. 5. It is a potent anti-oxidant that acts against oxidative damage. This damage is done by, for example: UV rays of the sun, pollution, toxins, stress. And this damage all leads to one thing: premature aging that shows up on the skin. When metals oxidise, we call it rust. When humans oxidise, we call it aging. Sometimes it also leads to disease. So we need something to help us prevent ‘rusting’. Anti-oxidants like CoQ10 are the answer and have a critical role to play in both the body and the skin. Vitamin Q, or Coenzyme Q10, is a life saver; without it our cells would not function properly, we would get old and ‘rusty’ a lot quicker. Make sure you supplement your body and your skin with CoQ10 so you can look and feel younger for longer. 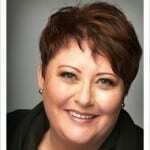 Jeanette Kemert is a Cosmetic Scientist with over 20 years experience in the skincare industry. She is a formulation development specialist, consultant and lecturer. In 2009, Jeanette founded JK Secret Cosmeceutics due to the high demand for an anti aging skin care range containing natural and organic ingredients combined with potent cosmeceutical ingredients. Next article The best way not to be sick is to be healthy!